An elegantly-appointed, modern home facing Phuket’s Patong Harbour near Kamala beach, Villa Benyasari is a stunning property with five bedrooms, open spaces, glass-enclosed living and dining pavilions, as well as a hint of traditional, Thai architecture. The villa is designed with a mind to intersperse the natural outdoors with the minimal and sophisticated interiors. 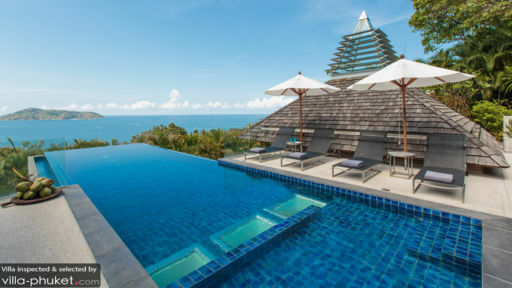 While you relax and chill in your 13-metre infinity pool, enjoy a freshly-grilled BBQ with friends and family. Watching the sunset will soon become your favourite pastime as you lounge on terrace and enjoy the view! There are five, well-appointed bedrooms at Villa Benyasari, each of them leading out to a private terrace with lounge chairs and an enviable view. These excellent bedrooms are furnished with king-sized beds, and single beds, making space for seven people. The minimal décor and soothing colours ensure a good night’s rest and a relaxed stay. 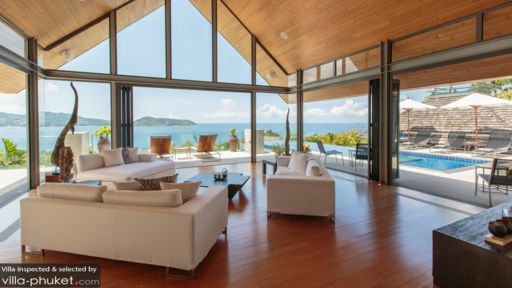 The floor-to-ceiling glass walls allow you to take in the scenic beauty of the island as you lie on your bed. The air-conditioned bedrooms are fitted with TVs that you can enjoy watching movies or shows on. Four of these bedrooms are accompanied by luxurious bathrooms with glass walls and splendid views. These are fitted with freestanding bathtubs and tropical showers for the most amazing bath of your life! Villa Benyasari exudes a contemporary classy vibe throughout, whether it be the terrace or veranda of the living areas. Right outside, as far as the eyes can see, is the splendour of the turquoise ocean with the hills beckoning in the distance. There is a 13-metre swimming pool at the villa, with an infinity edge, from where you can relish this panorama for as long as you wish. Rest up on the swanky sun chairs found on the pool deck, which are great for sunbathing under the hot, tropical, sun. To the side, you will find a casual outdoor dining situation, a wonderful experience next to the ocean. There is even a BBQ that you can make use of! Adjacent to the pool deck, there is the gorgeous, glass-enclosed living area at Villa Benyasari which features floor-to-ceiling glass walls and doors that lead outdoors. The high-pitched, Thai ceiling and the wooden floors enhance the understated, minimal beauty of this space tenfold. It has been furnished with comfortable, plush, white couches and armchairs for lounging and relaxation. For décor, you have the ocean, lush greenery, and the clear blue skies that you can observe from the glass walls! Another media room is found at the villa with beanbags, comfortable daybed, and TV for movie-viewing. If you want to enjoy the natural ambiance a bit more, you can always head to the terrace, which is furnished with comfortable sofas from where you can view the sunset while you enjoy a good wine! Besides alfresco dining, the villa even offers a breakfast bar indoors with several backed-chairs for you to dine on. The kitchen is fully-equipped with amenities like a coffee machine, double-door refrigerator, hob, microwave/oven etc. Apart from luxury amenities, the villa even offers services of a highly-skilled team including personal guest assistance for each and every guest, housekeeping staff for keeping the villa clean etc. Guests of the villa are served with a delicious breakfast each morning, to make for a great start to your day. If you wish, the services of a personal chef can be appointed to prepare your meals. Special services like massages, laundry, transportation can be arranged at an additional cost. 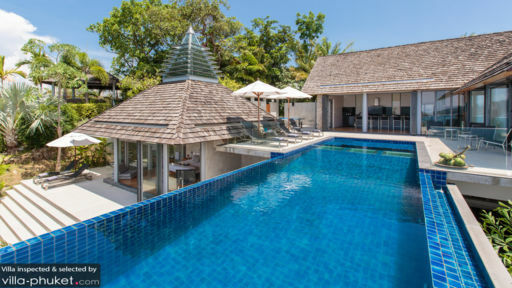 Located right on Kamala beach, the villa is quite conveniently situated as it is close to a variety of activities including surf breaks like Kalim beach, beach clubs Iguana beach bar, and restaurants services delicious Thai food like Old Siam. If you want to head to other beaches as well, you can head to Patong beach! A favourite villa holiday we have visited multiple times with family and friends. I like the clean architecture and decor in combination with stunning views. Sunsets are always beautiful from the hidden sala and the distant lights of Patong bay more interesting than the odd squid boat view from some coastal villas. The food is high end restaurant quality at cost prices. Tung the chef prepares some of my favourite foods , chicken cashew, duck curry, wing bean salad and glass noodle salad. I always leave a few kg heavier, but it is worth it. The resort staff are super helpful from the moment you land or preparing in advance. Car hire, boat trips, golf etc can all be arranged. Overall the villa gives the service of a boutique hotel with the privacy of a large villa. Located on the pretty west coast it is close to the madness of Patong and the great beaches of Surin, Kamala , Paradise (across the bay opposite the pool) and Laem Singh. The Sonos sound system is a plus for me as I like my tunes. So if you like great food, phenomenal views and cool architecture this is the one. The best thing about this villa is the people who work there, they are very friendly and very helpful. What I liked about the Villa was that there was somthing for everyone meaning there is a amazing infinity pool, a large T.V. room for everyone to watch some movies or play games. The location is the best becuase the Villa looks out on to the sea and other islands in Phuket, also the amenities were great because the Villa provided everything from cotton buds nice smelling shampoo and conditioner ect. But the best thing I liked about the Villa and my stay was that the food was amazing I would say the best food in Phuket becuase the chef does a range of everything from Asian to European. Villa Benyasiri has everything one needs whether as a couple wanting a self-contained, spa-style break, or an extended family Bacchanalian food-fest. I've done both, over the years and I love returning to Dom and Rachel's beautiful home for more of the same. The main reasons are: The food (unbelievably tasty, a la carte, Thai, with the option of egg-and-bacon sandwiches for breakfast. Just the thing after a vodka or two too many in town, or in the terrace! ), the wonderfully spacious and private accommodation (great beds, excellent air-conditioning, music, cinema room etc) and the fabulous views from the main part of the house, the terrace and particularly the pool. I really can't fully explain the overwhelming feeling of well-being and enjoyment you get as you pull up the hill towards the front door and the ladies who run the house welcome you with drinks and ice-cold towels to freshen you up on arrival from the airport. Go, see for yourself. You will love it! Khun Tung, the chef, is indeed unrivalled for her ability to produce the most amazing feasts at the drop of a hat that puts the rest of the big hotels to shame! The house is spacious and beautiful, immaculately clean and can accommodate a large hoard of family and friends. My favourite time is sundown, when you can make your way up to the sala to enjoy the gorgeous Phuket sunsets with a cold drink, while delicious smells waft up from the kitchen.... Must make that booking now!